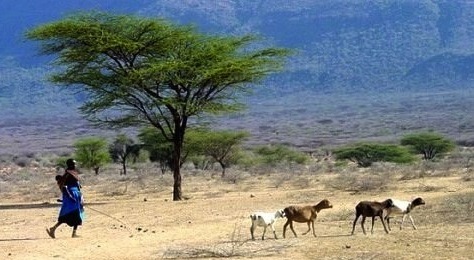 Climate Interactive is embarking on an exciting new project to understand and improve the long-term resilience of pastoralist communities in northeast Kenya. The Internal Displacement Monitoring Centre (IDMC) hired Climate Interactive to conduct an initial study of the drivers of livelihoods. The ultimate goal of the project will be to better understand how slow onset disasters like drought impact pastoralist families, and to implement solutions that reduce risk of displacement. Northeast Kenya, which will be our initial focus, is particularly sensitive to long-term drought. Climate Interactive will be using our unique, real-time simulation approach to make sense of the important data and trends within the region. Following a system dynamics approach, we’ve started by interviewing stakeholders and experts from Kenya. We’re using these interviews to construct causal loop diagrams of the complex social, economic, climate, and political systems impacting pastoralists. Community resilience is hard to understand and hard to predict. Climate Interactive has been evaluating community resiliency in a variety of disaster situations, such as recent storms in the US. Societies will need to better understand how to adapt to flooding, drought, and long-term climate changes. Climate Interactive is already considering projects involving other locations and disaster risks (hazards). We look forward to helping decision makers, at all levels and in all organizations, understand our adaptation opportunities and challenges. For more information about our work with IDMC and the Kenya project, please contact Travis Franck. An important initiative! This added focus on adaptation to climate change impacts at the local level is a valuable use of Climate Interactive’s systems modeling expertise and convening capacity. When drought, flooding, and other impacts (such as changes in rainfall patterns) are mentioned, I have to think that cooperation on adaptive water management will play a big role. When expanding the project beyond Kenya, I encourage you to consider Central Asia, where the need to adapt is as urgent, but research is lacking. It’s an interesting opportunity to create awareness of our local community. If only l can participate to the survey.